The Washington County Sheriff’s Office has charged a West Virginia man in connection to two robberies. 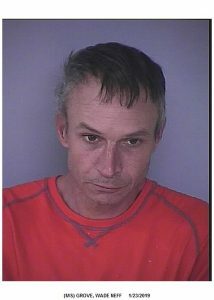 Wade Neff Grove, 49, of Falling Waters, WV, is accused of attempting to rob the McDonald’s, 12820 Clear Spring Road, Clear Spring, MD and robbing the Super 8 Motel, 16805 Blake Road, Hagerstown, MD. On January 22, 2019 at approximately 9:48 PM, deputies responded to the McDonald’s in Clear Spring for an attempted robbery. The suspect pretended to have a handgun in his coat pocket and demanded money from the cashier. The employee stated they could not open the cash register and the suspect left in a vehicle. At approximately 10:22 PM, the same suspect entered the lobby of the Super 8 Motel, pretended he was armed with a handgun and demanded money from the register. After receiving an undisclosed amount of currency the suspect fled the area in a vehicle. The suspect vehicle in both incidents was a grey Chrysler PT Cruiser. The suspect vehicle was observed by a Hagerstown Police Officer traveling on Burhans Blvd and later stopped on E. Washington Street. The passenger in the vehicle was identified as Wade Neff Grove and observed to be wearing the same outfit that was used during the robbery of the Super 8 Motel. Additionally, the clothing used during the attempted robbery of the McDonalds was observed within the vehicle. Grove was placed under arrest and transported to Central Booking for processing. Grove has been charged with Attempted Armed Robbery, Attempted Robbery, Armed Robbery, Robbery, Assault 1st Degree, Assault 2nd Degree and Theft $100 to $1500. Grove is currently being held on no bond at the Washington County Detention Center. On Thursday January 17, 2019 the Washington County Narcotics Task Force executed a Search and Seizure Warrant at 12035 Itnyre Road, Smithsburg MD 21783. Upon entry into the residence, Agents located over 7 pounds of raw marijuana, $12,000 U.S. Currency, 3 firearms, countless smoking devices, and 1000’s of Cannabis oil cartridges. 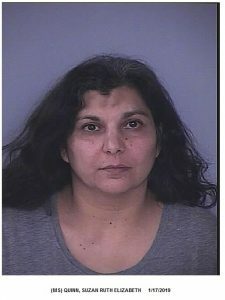 The occupant of the residence, Suzan Quinn, 41, was charged with Possession with intent to distribute marijuana. Quinn was transported to Central Booking for processing and later released on a $10,000 unsecured bond. Further charges are pending for other occupants of the residence, and additional charges are forthcoming. On January 11, 2019 at approximately 4:53 PM, Deputies responded to the area of Scarlet Oak Drive and Fair Oaks Court, Hagerstown, MD, for a report of gun shots. Upon arrival, Deputies spoke with witnesses who advised they saw a male shooting at the rear of a residence on Scarlet Oak Drive. Deputies found the back door of a residence in the 11200 block of Scarlet Oak Drive had been forced open. Deputies made entry into the residence checking for injured individuals. While in the residence, spent shell casings and a live round were observed on the ground. No one was located inside the residence. Additionally, Deputies also observed two entrance/exit bullet holes in the rear of the residence. After further investigation, Deputies learned from witnesses that a male, identified as Samuel Baygor Woods Jr., 32, of Hagerstown, went to the residence on Scarlet Oak Drive in order to confront another male. Once at the residence, Woods kicked in the rear door of the residence and began to argue with the other male. Woods briefly left the residence, retrieved a handgun, and went back into the residence. Witnesses reported hearing gunshots when Woods re-entered the residence with the weapon. Woods has been charged with Reckless Endangerment, Illegal Possession of a Regulated Firearm, Firearm Possession by a Convicted Felony and 3rd Degree Burglary. 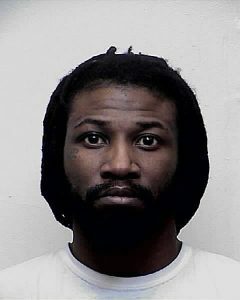 Woods is currently being held at the Washington County Detention Center on no bond. On January 4, 2019 at approximately 8:30 PM, Deputies responded to the area of Valley Mall Road and Underpass Way, Hagerstown, MD, for reports of possible gunshots. It was later discovered that a vehicle parked in the Olive Garden parking lot, on Valley Mall Road, had been damaged. The vehicle appeared too had been struck by gunfire. There were no occupants in the vehicle at the time of the incident. The Sheriff’s Office received no reports of injuries associated with this incident. Due to the on-going investigation, further information will not be released at this time. The Sheriff’s Office is asking that anyone with information related to this case contact Det. Lt. Footen at 240-313-2185.